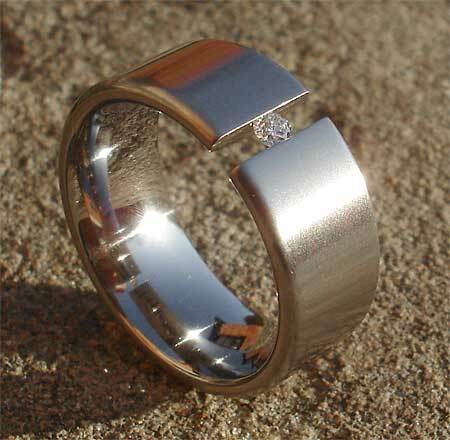 Tension Set Titanium Engagement Ring : LOVE2HAVE in the UK! This ring is the widest of our tension set titanium engagement rings made from the same high-quality aircraft grade titanium that we use for all our tension set rings so that the diamond is held securely in place. 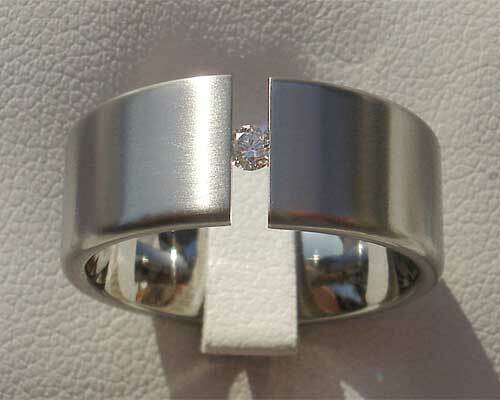 The ring measures a width of 10mm, therefore making it a possible option for a man, as men are now often choosing to wear a ring once they become engaged. Times have changed in our modern progressive world as not only have the styles of diamond rings. The ring has a single 0.6-carat white diamond, and the satin finish version is pictured, but polished is also available too. Tension setting a diamond means you will then have a diamond ring that will sparkle every day. Precious stone(s) Available: 1 x 0.6ct white diamond.